Figure 6. Example of a sickle-hocked steer. Figure 7. Example of a post-legged female. Figure 8. Correct structure desired for angle between stifle, hock, and pastern. Hind leg structure is one of the primary indicators of an animal’s ability to move efficiently. Evaluating cattle while they are walking is one of the most efficient ways to gauge structural soundness. One way to determine if the angle of the hock is correct is if the rear foot is placed in the tracks left by the front foot when the animal is moving forward. Cattle with the ability to do this are usually structurally sound in regard to their hind leg conformation. Large angles at the hock can seriously restrict the animal’s length of stride as far as the hind legs are concerned. When the angle of the hock is too large, the stifle, hock, and pastern are all pulled into a formation that is too linear to allow for adequate flexibility and proper function. Animals that suffer from this condition are said to be post legged. This condition causes problems for both market and breeding animals. Both males and females that are post legged are usually less efficient and less durable in a pasture. In conditions in which cattle need to cover large areas for forage, structural integrity is of utmost importance. A similar statement can be made in regard to feedlot settings in which cattle need to be structurally sound in order to compete for feed. 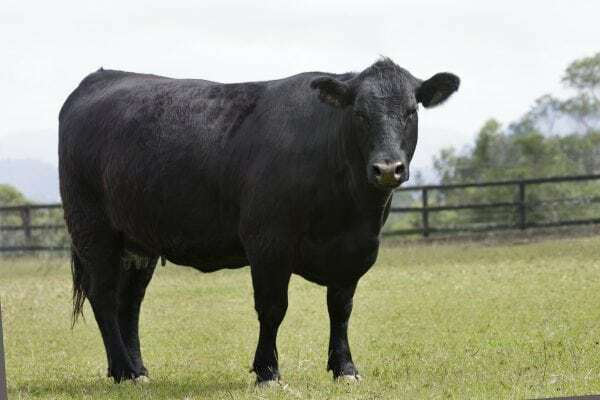 In regard to reproduction, bulls that are post legged can face issues when it comes to breeding due to the extreme angle of their hind legs and the fact that these legs support the bull’s weight during the act of breeding. These bulls may also face issues when it comes to traveling the distances associated with covering large groups of females in larger pasture settings. Just as the angle at the hock can be too large, it can also be too small, or acute. Cattle with this condition are commonly referred to as sickle hocked. With this condition, the angle of the hock is too small, and cattle usually have their hind legs and hooves placed too far underneath them. Cattle that are sickle hocked can sometimes overstep the hoof prints left by their front hooves. Although sickle-hocked cattle can also have an abnormal gate, this condition is far less detrimental to longevity and mobility than the short, inefficient strides seen in post-legged cattle. The importance of being able to assess hind leg structure in beef cattle is vital to assessing potential longevity of the animal as it relates to structural integrity. Although no method is fail-safe, evaluating the pastern, hock, and stifle in order to see how they align is a solid step. Ideally, these three joints will align in an angle between 140 and 145 degrees. The calves shown in Figures 6 and 7 are examples of sickle-hocked and post- legged cattle, respectively. Figure 8 shows a 145-degree angle between stifle, hock, and pastern, which would fall into the ideal range.